This Event has been read: 763 times. I have also always said that Vino Nobile de Montepulciano is the best value in Tuscany, you get a similar quality wine to Brunello di Montalcino at close to 50% of the price. 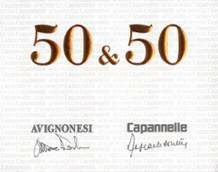 Avignonesi is one of the benchmark wineries from this region and tonight we have the owner Virginie Saverys in to showcase all of the wineries current releases along with a vintage selection of their “Cult” wine 50/50 from 2008. I don’t know if they still make this wine but we have a bunch of it and the last time I tasted it the wine was still excellent! The 2016 Rosso di Montepulciano is delicately spicy, with intense aromas of red berry fruits and hints of linden in flower with an elegant touch of violets. The flavour is smooth, complex and long lingering, expressing a beautiful harmony between freshness, acidity and sweetness. Our Vino Nobile di Montepulciano 2014 is 100% Sangiovese, picked from September 18th until October 10th, sourced from our 8 vineyard estates in the Montepulciano DOCG area. Elegant aromas of fresh, red berry fruits with delicate oral undertones and an intriguing balsamic touch. The taste is medium-bodied and round with fragrant fruit, silky tannins and a long lasting, mineral finish. A blend of 85% Merlot, 15% Cabernet Sauvignon. Intense, deep red in color, Desiderio 2013 reveals inviting notes of sweet cherries and raspberries, rose petals and aromatic herbs, enhanced by subtle hints of menthol, red licorice and chocolate-dipped coffee beans. The flavor is smooth and fruit-driven, with chewy tannins and a deliciously savory finish. 50&50 2011 has a deep, ruby, red color. Aromas of blackcurrant and black cherry are complemented by notes of sandalwood, sweet spices, and menthol. The rich and velvety palate has a fruit-flavoured core with subtle complexities from the long ageing in oak. Long-lingering and elegant, this is a wine suitable for long ageing in the bottle. 2011 saw a typical, sunny summer and a warm autumn, which favoured the production of round, full-bodied reds with lots of ripe fruit. The 2008 is now 10 years old and will showcase a mature version of the unique merge of Chianti Classico Sangiovese and Cortona Merlot, 50&50 is an extraordinary wine which mirrors the incredible span of Tuscan wine quality across the appellations. A visionary wine and this vintage should be getting close to maturity for most Tuscan wine lovers. This caramel colored Vin Santo, vintage 2013, is characterized by intense aromas of toffee and dark chocolate, softened by acacia honey and Mediterranean herbs. Notes of freesia, candied orange peel and French pastry develop as the wine opens. On the palate, this sweet wine reveals new and surprising flavors with every sip; fig, almond, lemon, and roasted coffee bean. A perfect balance between the acidity and sweetness compliments a sensual finish. 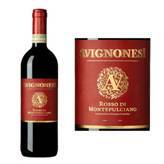 The winery is named after the Avignonesi family, the founders of the original estate. Constant research and development aimed at expressing the true character of the Montepulciano terroir has, over time, earned the winery a well-deserved place among the flagship producers of Tuscany. 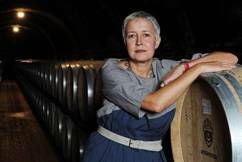 In 2009, Avignonesi was acquired by Virginie Saverys who has since introduced organic farming methods to craft distinct, genuine wines with an even stronger character, and has acquired additional vineyards and a state-of-the-art winemaking facility in the Montepulciano appellation. 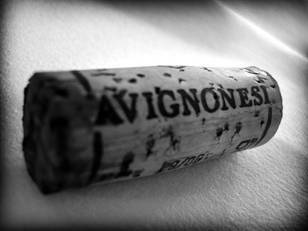 They believe that the life force of the earth and the uniqueness of their terroir are at the heart of the Avignonesi brand. Avignonesi is reborn from the soil of the vineyards with each vintage in wines that mirror the subtle flavors of the site and the special traits of each year. The wines express the richness and beauty of the Montepulciano territory. They respect the heritage of Montepulciano, where Sangiovese wines have been produced for centuries, and they wish to contribute to its future by being the finest representative of its heritage that they can be. They respect the innate character of each wine and seek to follow its natural evolutionary path from the soil to the cellar and - finally - to the bottle. These wines are made from 100% Estate fruit, they cut the production to do this and they are all biodynamically farmed, 100% Sangiovese with minimal use of new oak, 2nd and 3rd passage. Virginie was born in Ghent, Belgium and graduated in law from the University of Paris in 1983. Virginie was brought up in a family that always enjoyed fine wines and, as a wine lover, decided to invest in the Avignonesi winery in 2007, after having retired from her highly successful legal career and moving to Tuscany. In 2009 she bought the whole of Avignonesi with the intention of taking a winery already recognised for its quality, innovative research and experimentation to a new level of excellence. She is a strong believer in organic products and homeopathic medicine, so converting the winery to sustainable farming methods was a natural choice. Her aim at Avignonesi is to produce wines which do not only mirror the distinct identity of the terroir of Montepulciano, but wines which are healthier for her customers, healthier for the land and therefore for future generations. This is a truly unique, produced with the best grapes of Sangiovese and aged 10 years in small barriques. Dense and dark, Occhio di Pernice is rich with aromas of dates, dried plums, and fruitcake, coupled with warm baking spices and candied lemon. A “Once in a Lifetime” wine experience!